The major near-term threat to the health of those living around landfills more likely comes from releases of toxic substances into the air carried by the wind as much as several miles from the site, than it does from contaminated drinking water. To date, EPA has ignored statutory mandates to strictly regulate these air emissions. Citizen action is needed to prod the agency to finally act to protect public health. Among all of the issues related to air pollution from landfills, odors have long attracted the most attention, more recently followed by their greenhouse gas emissions. But, of great concern to those who live downwind from nearby landfills are the risks from illness, cancer, death and genetic damage from chronic exposure to low levels of the hazardous air pollutants that escape from these sites whenever gas collection efforts are inadequate. Even though contaminated drinking water has long worried landfill neighbours most, groundwater flows usually move slowly. Air transport is the more probable vector that the hazardous pollutants in landfill gas follow causing most of the health impacts that are observed in the near-term. Moreover, air pollution travels further than is often recognized. For only some of these gases can be smelled, and none of them are visible. Yet, plumes carrying hazardous pollutants from landfill gas can be detected with instruments for as much as five miles downwind from a landfill. 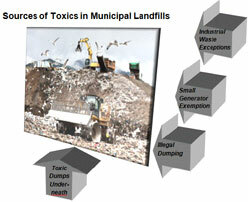 Effect of toxics released from landfills. One hundred and eighty seven compounds have been listed by EPA as hazardous air pollutants found in landfill gas[Table C]. 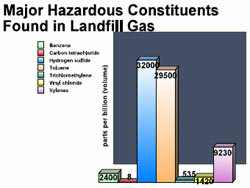 The major toxic substances and their concentrations found in landfill gas are shown in the CHART along side. When they escape, these toxic emissions in landfill gas have the potential to adversely impact the health of those living downwind from landfills with inadequate gas controls. Types of health impacts.. Some of the major hazardous air pollutant released from landfills are benzene, carbon tetrachloride, hydrogen sulfides, touluene, tricholoroethylene, vinyl chlorides and xylenes. In addition to cancer, gases emitted by landfills can also cause liver damage, potential reproductive and developmental hazards, effects on the blood, liver, and kidneys, irritation of the upper respiratory tract, eye irritation, sore throat, nausea, dizziness, headaches, difficulty with sleep, facial and limb abnormalities among children, and delayed development and increase the risk of spontaneous abortion. Several studies surveyed in the technical literature suggest that the concentrations of hazardous air pollutants from landfills adversely affect the health of people living adjacent to or near landfills. Notwithstanding the fact that landfill-gas-to-energy is erroneously considered to be a good thing, attempts to recover energy will increase toxic releases by degrading gas collection. Studies found suspected health impacts.. A study in New York State, for example, found that female landfill neighbors had four times the bladder and leukemia rates as in the general population. A U.K. study found that babies whose mothers lived within two miles of landfills had a 5% greater risk of low birth weight, a 12% greater risk of abdominal wall defects and a 24% greater risk of gastroschisis and exomphotos. 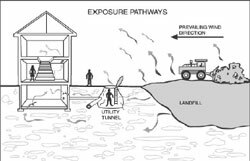 However, because those researching the health impacts on landfill neighbors have not been provided with sufficient funding to single out those who breathed the fugitive emission, epidemiologists have been relegated to single case studies using gross measures of proximity, like postal zip codes, that bear only a tenuous resemblance to the downwind area where the affected population is localized. Costly biomonitoring, which could pinpoint actual exposures to specific chemicals in individuals, are out of the question. Consequently, for one thing, the areas where epidemiological data is examined include both affected and unaffected populations. For another, the hazardous loadings and local land uses vary significantly from landfill to landfill. There ought to be no surprise, then, that the results fail to find statistical significance – by their designed limitations, the studies were intended from the outset to fail to produce usable results. Among the reasons the 2,500 municipal solid waste (MSW) landfills are so lightly regulated is a widely disseminated distortion that hazardous discards are prohibited [sec. 258.2 definition for municipal solid waste], and that only benign material is buried there. However, in practice, there are many pathways for those hazardous discards to be accepted at and for toxic gases in landfill gas to be generated in municipal solid waste (MSW) landfills. Tests undertaken by EPA to support its landfill groundwater rules in 1991 failed to do so. Those tests “did not reveal significant differences at that time in the number of toxic constituents and their concentrations in the leachate” between sites with hazardous as compared to putatively sanitary waste streams [p. 50982]. Legacy toxics. Many lined landfills were permitted on top of open dumps near cities, even though large quantities of hazardous wastes were buried there before 1991 and many had known leaks. This happened as national waste firms, looking for permitted sites close to their collection routes, offered local officials, in exchange, to take the dumps off the city’s hands. Small generator exemption. The statutes and rules provide a “small generator” exemption for the more than 100 hazardous compounds contained in common household cleaning, pest control, cosmetic and home improvement products [sec. 261.5]. Those that are volatile organic compounds, such as benzene, toluene and methylene chloride, can readily be mobilized from buried wastes and, when not captured and destroyed in gas collection systems, are transported into the atmosphere by the methane generated in large lined landfills [download 5/30/91 proposed rule from list, at p. 24473]. Delistings. EPA has either generally exempted several classes of industrial wastes, such as coal ash, construction and demolition debris and sewage sludge, even though they, in fact, harbor hazardous constituents; or, it has granted, on a caseby- case basis, “delistings” of substances that have been listed as hazardous predicated upon proponent’s claims that, in a particular landfill under specified conditions, they will be bound up and not migrate. An example of such an exception that later proved problematic is aluminum dross, which in the presence of water causes landfill fires that can result in the release of several air emissions injurious to public health. Reactions. Biological and chemical reactions sometimes convert otherwise comparatively benign constituents into highly toxic compounds, such as the conversion of elemental mercury from fluorescent bulbs and switches into dimethyl mercury. Even when mercury is captured in a gas collection system, as an element, it cannot be destroyed, but, instead, escapes. Dioxin formation. Landfill gases captured in gas collection systems include at least 41 halogenated compounds, such as chlorine, fluorine, or bromine. When halogenated chemicals are combusted in the system’s shrouded flares, that occurs in the presence of hydrocarbons, which can recombine into highly toxic compounds, such as dioxins and furans. These are among the most toxic chemicals known, even at minute concentrations. Burning at high temperatures does not solve the problem as dioxins are formed at low temperatures and can be formed as the gases are cooling down under the shrouds that cover the flare. In facilities that recover energy with internal combustion engines, there are indications that the destruction rate is significantly lower. Illegal dumping. Hazardous wastes are illegally dumped. Some of them are volatile, and, when not captured, escape into the atmosphere. A fire was first observed in 2006 at the Republic Countrywide landfill in Ohio, when state regulators grew concerned over field reports at the facility with indications of higher temperatures, abnormal settling of waste, severe odors, hydrogen gas, carbon monoxide and benzene emissions, all indicative of a subsurface landfill fire. The costly and implacable nature of underground blazes was well known to the industry. In the face of obvious evidence of fire, the company repeatedly refused to acknowledge and act on that fact, even as the terrible odors kept getting worse. In the end, Countywide was found to be experiencing one of the worst and most costly landfill fires in the United States caused by the acceptance of an industrial waste, aluminum dross. At last count, it has lasted 11 years, with no sign of abating, has inflicted upon neighbors especially noxious odors, headaches, nausea and an elevated risk of cancer and birth defects. To date, the fire is reported to have cost the company more than $100 million and the state, upwards of $1 million. The Countywide landfill fire story deserves its own book, like A Civil Action about the chemical poisoning from the W.R. Grace factory in Woburn, Massachusetts. Until someone does, the pieces of this tragedy can be found in the excellent newspaper accounts, in the Beacon Journal in 2007 from February 21 and 22, March 29 and December 28; in 2008 from January 15, February 22, May 2, 7 and 29, September 6, October 1, 4 and 8, and December 11; in 2009 from January 5 and March 31; in 2011, in 2011 from November 20; as well as from the Canton Repository in 2007 from May 30 and December 7; in 2008 from January 3; and in 2009 from April 1 and July 19. Notwithstanding the undisputed fact that there are toxic gases released from MSW landfills [p. 9917], and the clear statutory requirement [§112 (d)] for EPA to impose strict abatement requirements on landfills that release these dangerous emissions in landfill gases, the agency has so far refused to do so. The history of EPA’s decisions concerning dangerous emissions from MSW landfills has been a record of regulatory failure, in direct violation of the applicable laws. Applicable law required strict rules for toxics. In 1990, Congress updated the twenty year old Clean Air Act. For air polluters who emitted toxic compounds, the law's intent was clear. Among other things, the Act required EPA to follow specific protocols to insure that the Maximum Achievable Control Technology (MACT) was determined from a survey of the best 12% of facilities, and to impose rules that were at least as strict on sources that emit known hazardous air pollutants (HAP). Also, area sources of air pollutants, such as landfills, were covered by this requirement along with more traditional smokestack industries. EPA acknowledged landfill’s toxic emissions but refused to act. Early on, EPA recognized that the harmful gases released from landfills legally met the definition of HAPs, but, through three administrations, the agency chose to not enforce the law. Not only did EPA not impose the strict standards required on landfills’ hazardous emissions, it failed to even require modest ones. EPA replaced prescriptive requirements with unenforceable goals. EPA even eliminated the specific prescriptive specifications from the agency’s original proposal in 1991 to regulate non-hazardous emissions from landfills, without imposing any enforceable performance standard in its place. The stated intent was to allow landfill owners “to design their own collection systems [and] to provide flexibility [pp. 9907 and 9911] and encourage technological innovation” (which was never done for the purpose of improving overall gas capture). In the process, critical requirements, essential to minimize the escape of hazardous gases, were deleted from the final rule in 1996. EPA delayed when gas collection required. As a troubling example, in the proposed rule, gas collection equipment was required in the original proposal to be installed at the end of the second year following waste emplacement [download 5/30/91 proposed rule from list, at p. 24484]. This was based upon the fact that decomposition begins to throw off significant gas in about six months. After allowing for time to build up sufficient mass to support an extraction system, two years was the maximum time the agency felt was needed to delay gas collection. But, the landfill industry objected that they wanted to ramp up the size of landfills one-hundred fold, quadrupling their height, in order to increase profitability. To accommodate their plans to super-size landfills, they argued, would take much more than two years to fill the facility to that larger height. Limiting landfill’s size to minimize fugitive gas would be “costly” [p. 9911], they complained. In the anti-regulation fervor that existed at that time, EPA did not prioritize public health as contemplated in the statutes. Nor did the agency indicate that it gave any consideration to the risks to the neighbor’s health against the benefits to industry’s economic interests. Based on the record, EPA’s decision was controlled preternaturally by the desire to provide “flexibility” [pp. 9907 and 9911], which, apparently, had become the code word for de facto de-regulation, without regard for the controlling statute's requirement for the maximum technology. Ignored was the the fact that, by moving the goal posts for when gas collection was required, much more toxic gases would be released uncontrolled. Consider the emissions from a large mega-sized landfill receiving 10,000 tons per day, which the industry claimed would need those additional three years before collection pipes could be installed to give more time to fill their super-sized facility. According to the agency’s gas generation model, Landgem, 214,851 tons of landfill gas would be generated during those three years that the industry was generally allowed to delay installation of a gas collection system, as shown in the CHART along side. Those downwind of that mega-fill could be exposed to almost a half million pounds of hazardous gases. EPA exempted all but the largest landfills [p. 9907]. Also, unlike the European Union where all landfills are covered by the air rule, in the United States, EPA’s singularly vague rule not only allowed the owner near complete discretion over the design of the system. In addition, the rule only covered the largest facilities, generally those designed for more than 2.76 million tons of waste. That extremely high threshold for coverage exempted 95% of landfills [pp. 9914-9916]. EPA relied on system that was largely dysfunctional. Most important, for the few landfills that were covered, by design, these vacuum-based systems were largely dysfunctional. For they only had the potential to really work during the limited period of time when the site is sealed with a final cover and little gas is generated, while they lacked functionality when most gas was generated. As described in the earlier discussion of the IPCC conundrum, before the cover is installed, and after postclosure care ends when the cover fails – which are the times when most gas is generated – those systems envisioned in the rule either are not installed or are no longer operational or, if in place, are not functional. EPA only required what industry was already doing to prevent losses. Not surprisingly in view of the political climate of those times, the only substantive thing that the rule did achieve was to codify what the landfill industry had found it was economically compelled to do anyway, regardless of whether there was a rule that required it to do so. For in those large landfills that were affected by the rule, after a geomembrane cover had been installed, so much pressure built up from the gas generated by the residual moisture that the pressure overwhelmed passive venting systems. 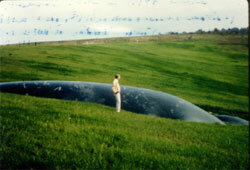 Too often, in sites without active gas extraction, that pressure literally blew out the expensive final covers, as shown in the adjoining photograph. Real abatement would undermine landfill economics. A concerted focus on really minimizing emissions would have fundamentally altered the structure of the landfill industry and undermined its economic viability. For, among other things, to function properly, gas collection systems require a seal that is not created until an imperviable final cover is installed. Pending the cover, vacuum forces through the collection system have to be ramped back to avoid pulling oxygen from the surface into the pipes below, where the mixture with methane would be flammable. Yet, once the cover is installed, and for as long as it retains its integrity, little rainfall will enter the site to replenish the essential moisture for decay, and gas generation, to occur. Putting the two opposing cross-currents together, gas collection only really works when little gas is generated. Conversely, when most of a landfill’s gas is produced, either there is no gas collection, or if there is, its functionality is impaired. 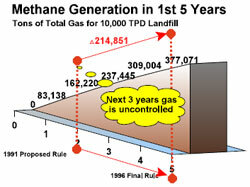 Since effective gas collection in landfills is impossible during those times when most of the lifetime gas is generated, the only way to prevent the escape of major volumes of toxic compounds and greenhouse gases is to divert those discards that decompose from the landfill in the first instance, as well as to do a better job of rejecting loads with toxic constituents no matter the source. That would deprive today’s landfills of about half their tonnages, which would create massive overcapacity for landfills, and undermine the business model of the waste giants. Barring an organics ban, the only way to really take a big bit out of fugitive gas is to make the site smaller so it would fill faster and be open for less time. But, doing that would amount to a ban on mega-sized landfills, which would rob them of their economies of scale and leave them uncompetitive in the marketplace. In the annals of regulatory history, regulators have rarely interceded, even in the case where the statutes would seem to compel it, when the resulting costs from their rules would undermine the industry’s business model. Similar, landfill owners were not anxious to incur additional abatement costs, which would not contribute to the bottom line, but would make burying trash more expensive than their competition, recycling and waste-to-energy. Early Horizontal collectors. Install horizontal gas collectors in active areas in each lifts prior to installation of vertical wells, but delay operation until there is sufficient depth and cover to apply vacuum. Space horizontal collectors to overlap each pipes’ zone of influence when negative pressures are applied without short circuiting without a low permeable cover. Do not co-utilize horizontal collectors for gas collection and liquid recirculation. Multiple wells in same bore holes. Install different vertical wells for different depths in same bore hole in order to be able to apply distinct optimal negative pressures at each level as compaction increases with depth but the risk of excess infiltration from the surface diminishes. Leachate collection system connection. Connect the leachate collection system (LCS) at the high side on bottom of landfill, which often carries gas that follows the LCS gravel trench or piping, to the active gas collection system (GCS). Multiple seals around bore holes. Utilize at least three sets of seals or their equivalent, including bentonite, clay and well bore seal, to connect the collection wells to the final composite cover in order to minimize air infiltration and maximize vacuum forces. Check methane leak rates around the seals at each well head monthly during typical atmospheric conditions using an analyzer compliant with EPA Method 21, and if greater than 500 parts per million above background, repair the seal within three days. Installation of vertical collectors, maximum slopes and final cover. Each cell should be designed to reach final grade in not more than one year from first waste emplacement. The active vertical collectors should be installed by that time and connected with headers to a vacuum system. Not more than one year after reaching final grade, a final low permeable cover less than 1 × 10 cm/sec. should be installed. -5 If a geomembrane is used to provide a low permeable barrier, exterior side slopes should not exceed 4:1 to facilitate stabilization over a geomembrane. Alternate final covers are incompatible with effective active gas collection and should no longer be allowed. Delay any recirculation of leachate. Leachate circulation is not being recommended, but if it is, do not commence recirculation until after an expendable low-permeable cover and active gas collection system has been installed. De-water flooded vertical wells. In addition to monitoring each well’s performance for oxygen and nitrogen infiltration, monitor gas volumes to detect wells that may be flooded, and pump out flooded wells. Don Augenstein, et. al., Improving Landfill Methane Recovery -- Recent Evaluations and Large Sc ale Tests (2007); Hans Oonk, Expert Review of First Order Draft of Waste Chapter to IPCC’s Fourth Assessment Report (2008). SCS Engineers, Technologies and Management Options for Reducing Greenhouse Gas Emissions From Landfills (2008); and 40 CFR Part 60 W W W .
His conversion was not just rhetoric. EPA was directed to downplay regulation and prioritize voluntary programs that the industry wanted, such as the Landfill Outreach Methane Program. Substantially more resources were devoted to those partnerships than was provided to protect the affected downwind populations that the Clean Air Act Amendments had promised. EPA’s turning away from its original regulatory mission continues in many areas such as this one, notwithstanding the fact that independent technical studies have found that the partnerships have had no impact on improving corporate behavior. Later rules, in which EPA claimed to comply with the Act’s hazardous waste requirements, in fact, did not do so. Rather, they only added three miscellaneous provisions on unrelated matters dealing with collateral start ups and shut downs of gas collection systems and bioreactor experiments. In a deliberate act that devalued the lives of those residing downwind from landfills, nothing was done to follow the specific survey requirements for determining the very best gas collection practices to order impose them across the board. The SIDEBAR along side lists the kinds of practices EPA would have found in the top performing landfills (most in the public sector), which it should have adopted for landfills in order to comply with the Clean Air Act’s requirement to impose the strictest rules at sources of hazardous air pollutants. How consequential EPA’s decision was to, at best, de-emphasize, and at worst, ignore, the well being of the people who live downwind by failing to adopt strict rules, is not known. For EPA, along with the ATSDR, have also chosen to not fund competent statistical studies to document the extent of the harm. The untold tragic stories of those who may have been injured or killed by landfills’ toxic legacy are legion and cry out to be heard. 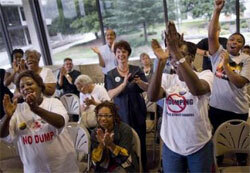 Landfill opponents in the overflow seating area applaud speakers who opposed reopening the White Street Landfill at Tuesday’s City Council meeting. Source: News Record. Even though EPA has not responded in the past to these concerns about toxics in landfill, hope in the future can come from the fact that global warming affects everyone and not just the few who live downwind from landfills and from grassroots organizing. While toxics released by landfills impacts mostly its neighbors, the methane also released by landfills is a leading cause of global warming, which affects everyone. As the need for measures to reduce greenhouse gases becomes more important, the fact that landfills are a significant source of methane should also help landfills’ unfortunate neighbors attract support for their plight, too. For it is the methane that strips out and mobilizes many of these hazardous compounds, and puts their well being at serious risk. The potential for local organizing to arouse broader public opposition is further grounds for optimism that health issues will not always be discounted by the regulatory bureaucracy. Over the last ten years, concerted efforts by community groups led to the early shut down of the Austin, Battle Creek, Live Oaks, Pottstown, and Sunset Farms landfills, and in the decade before at Puente Hill landfill, over health and other concerns.